The Rimrock Resort truly is a diamond set among the beauty of the Canadian Rocky Mountains. It is a must for those who are seeking a resort close enough to the attractions, while at the same time providing the feeling of being lost in the wilderness. It is the perfect place to rest your weary head while exploring nature’s beauty. Reserving the perfect room for my short journey to Banff National Park was made easy by the reservation clerk at the Rimrock Resort. She was pleasant and helpful and recommended that I join the Loyalty Program so that I would receive some additional perks and benefits. Since I was only going to be visiting Banff for 3 nights and 2 days, I knew exactly what I wanted to see. The reservation clerk recommended that I contact the concierge prior to my arrival to book my tours so that I would be guaranteed to see the attractions that I wanted to. The concierge was fantastic! After the initial telephone call, we corresponded through email at which time he sent me a list of all of the tours available during my stay. I eventually chose my tours and booked them directly with the concierge. My only disappointment was the hiking tours that I was hoping to do were not available. Banff had experienced a long lasting winter and the hiking tours weren’t being offered until June (I was visiting in May), due to snow and the potential for an avalanche. Next time! For my purposes, the Rimrock Resort couldn’t have had a better location. It is located on Sulphur Mountain, a 5 minute drive from Banff. The famous Banff Hot Springs and Banff Gondola were just a short walk away. If you want to spend time in the Village of Banff not to worry, the Resort provides free bus service to and from the Village. The Resort offers various room types from a standard double to suites. I opted for the Premium King room which offered a huge balcony over-looking the mountains and the resort courtyard. It was the perfect spot to have my morning coffee and my evening glass of wine. The room was massive and provided all of the usual amenities, including a Keurig machine, coffee, refrigerator, nice size flat screen television with an ample number of channels, hair dryer, body wash, shampoo, and conditioner. There were also snacks and water available, for a fee. Primrose: The Primrose is located on the level below the main level and offers a full view of the mountains. It serves primarily Italian cuisine which is to die for! Larkspur: This restaurant is located in the main lobby and also provides a view of the mountains. The cozy fireplace offers the perfect spot to relax with a cocktail and new and old friends. Not to worry if you are feeling hungry, it also offers light snacks and pub fare. Eden: Eden is an upscale, fine dining restaurant, which also serves finer wines. The prices of this restaurant also reflect the quality of food you will be eating. I didn’t have the opportunity to dine in this restaurant, but I will definitely be giving it a try next time. Diva’s Cocktail Bar: This bar is open on weekends and serves cocktails and martinis of your choice. It is the perfect spot to sit back, relax and take in a sporting event. It wasn’t open when I was there, hopefully next time I will be able to check it out. Rimrock Café: Being that I am a coffee addict, I frequented this café regularly for my coffee. The café also carries some backed goods, snacks, water and pop. There are several tables outside of the café so that you can sit back with your coffee and do some people watching. Room Service: I didn’t have the opportunity to use the room service, however it did appear that the menu was quite extensive and reasonably priced. The Rimrock Resort offers the typical amenities such as an indoor pool, hot tub, conference rooms and a spa, which had daily specials while I was there. Outside in the grass courtyard, you will find a large open space to relax with a cocktail. There is also a fire pit to warm you up during the winter months. Be sure to check out all of the trails while you are there. When budgeting for your stay, remember to factor this into your budget, as it can add up. I am sure from my review that you can tell that I would return to this Resort in a heartbeat! The customer service, concierge, restaurants, room and amenities were second to none. 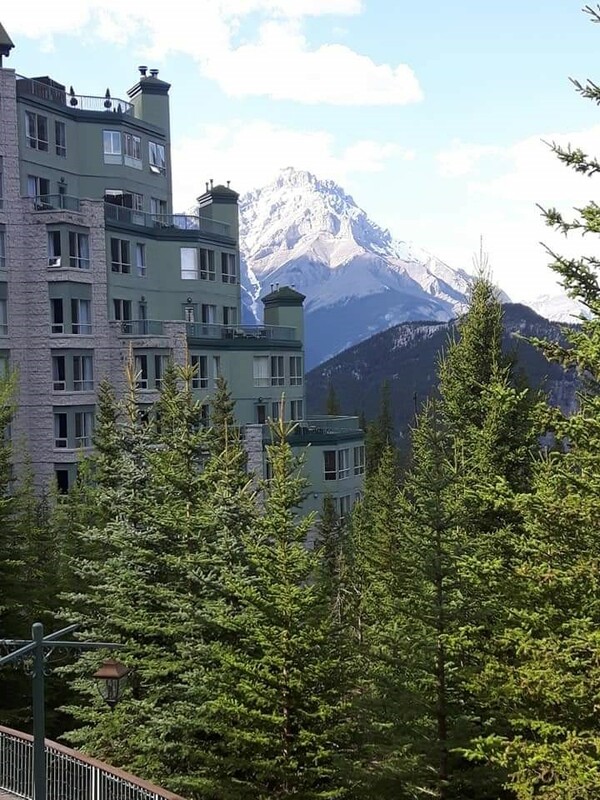 The location is perfect for enjoying the beauty of the mountains, but close enough to all of the attractions that Banff has to offer. If this wasn’t enough for you, perhaps the exemplary customer service and elegant, but warm and inviting ambiance will encourage you to book this resort for a rest in the beautiful Canadian Rockies. It truly is a diamond in the Rockies that continues to sparkle. I love places to stay that are right in the mountains and kind of hanging on the edge like this. How fun!